Rent Avanza in Bali is a mini MPV. 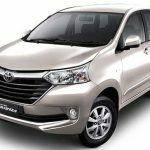 Daihatsu fully designed and manufactures the vehicle, which then sold by both Toyota and Daihatsu under the name Avanza and Xenia. Daihatsu supplies the vehicle to Toyota under a consigned production and OEM manufacturing agreement. The car was launched in 2003 and sold over 100,000 units that year. The name “Avanza” was taken from the Italian word “avanzato”, which means “advance”. Both Avanza and Xenia share the same specifications and all the amenities and both cars are one of the best fuel-saving car with its 4-cyllinders, 1300cc engine and also available in 1500cc version. This mini MPV is one of the most favourite car to rent/hire in Bali island. And can fit 7 up to adults, and foldable rear seating will fit large luggages when you arrive or departing at the Bali Airport. Very suitable for family or small group.